The main problem with Leslie Zemeckis’s history of burlesque is that it doesn’t reveal enough. It’s obvious from the impressive group of ex-dancers who have been gathered that the subject is of great significance to the filmmaker, but, unfortunately, the story just doesn’t…er…take off. Considering the film’s participants include such scantily clad luminaries as Sunny Dare, Tempest Storm, and Blaze Starr, it comes as something of a disappointment that the banter remain so tame. Many of the ex-dancers have understandably settled into geriatric complacency, but their memories don’t lift the film to a more memorable level. I’ve been to a bunch of press screenings at the Tribeca Screening Room on Greenwich Street. I was planning on going to many of them but just haven’t gotten to. But this weekend I nailed some. I saw an Irish dramedy called “My Brothers” which I liked. I then saw a Filipino movie called “Lola” about to no-nonsense grandmothers from impoverished Manila. 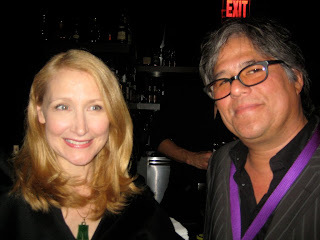 This was followed by a romantic drama starring Patricia Clarkson called “Cairo Time”. It was a good film but Clarkson left me a bit cold at times. This shot (left) was taken at a TFF party for the opening of the 2008 film “Guest of Cindy Sherman”. Yesterday I managed to make it to 2 more films; both of which were very good. There was an Iranian allegory called “The White Meadows” and a terrific comedy called Please Give by a director I have come to really like, Nicole Holofcener. Starring Catherine Keener and Oliver Platt, this was a great old-fashioned NYC comedy. I am trying to get into the press day for that later next week. The Festival begins Wednesday evening though tomorrow, Tuesday, I will be going to the official press conference opening ceremony where Robert De Niro and Jane Rosenthal will kick things off. Hopefully I’ll manage to get some nice photos or video. In the next issue of WestView, I plan on writing about the festival and not really write reviews. Film Forum is celebrating its 40th Anniversary this year. The milestone anniversary was topped off with a retrospective at MoMA earlier this winter called Karen Cooper Carte Blanche: 40 Years of Documentary. I had the good fortune of interviewing Ms. Cooper, who as of this year has been Director of the Film Forum for her 38th year. Adam Schartoff: Prior to your tenure at the Film Forum, did you have a background in film? Karen Cooper: No, not really. One class in film making (super-8) my senior year. I was at Smith. It was given at nearby Amherst College. Mainly I studied literature and theater. Spent my junior year in London: traveling and going to theater. AS: So, what was your first role at the Film Forum all those 38 years ago? Cooper: My first role at Film Forum was as Director! I met the co-founder, Peter Feinstein, in 1972 while working for a film monthly. He offered me the business, such as it was: $19,000/year budget, 50 folding chairs, screen the size of a bread box. AS: How did he come to discover you, though? He read some of your articles and had an “ah hah moment”? It seems like quite a leap of faith to hand you the business as you describe it. I am going to gush for a moment. I’ve seen and met any number of celebrities over the years. Okay, I haven’t met Robert De Niro and, though I’ve been in the same room as David Byrne on at least three occasions, I’ve never spoken to him. But finally I got my nerve together enough to introduce myself to someone I’ve loved for many years. I first became acquainted with Andrea Martin on that strange but always funny parody about a Canadian TV network called SCTV. Like all the players in that great ensemble cast —which included Eugene Levy, Catherine O’Hara, John Candy, Dave Thomas, Rick Moranis, Harold Ramis & Martin Short— Andrea portrayed a number of recurring characters, most notably station manager, Edith Prickley. Since that show left the air many decades ago, Martin has become something of a character actress in mainstream films. With the enormous success of “My Big Fat Greek Wedding” —which I still have not seen— she’s now a recognizable celebrity once again. Rightfully so. Anyway, I was at the opening night after-party for a new independent film called “Breaking Upwards”. As Andrea has a supporting role in this charming romantic comedy, I was hoping to run into her. And I did. I saw her at the bar and introduced myself. We may have spent about 5 minutes chatting before her friend showed up. I had an urge to reach into my pocket and pull out my digital camera but suppressed it. That was a good call. Well, my tactfulness paid off. A couple of nights later I was once again attending a screening of a small indie film, this one my friends’ Carmine & Matthew’s new movie, “Lbs.” at the Village East Cinema on Second Avenue. After the Q&A had ended, who shows up for the following screening but Andrea Martin. She was saying hello to Matthew and Carmine when I walked over and reminded her who I was. She remembered me and this time was only to happy to share a photo op. There, I’ve gushed. While I was attending all those press conferences at MoMA and Lincoln Center for the New Directors/New Films series a couple of weeks ago, I missed a small number of entrees. 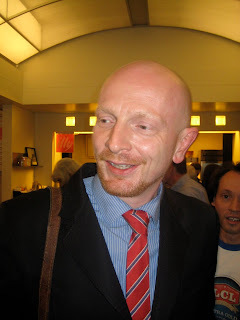 With the permission of the publicist, I went to the public screening of one of them, “The Red Chapel”, a documentary by the Danish filmmaker, Mads Brügger. A remarkable work: Brügger brings two young men both born in North Korea but adopted to Danish families at birth. One, Simon Jul, is a fairly well known comic, known as the Danish John Belushi, given his beefy physique. The other, a wheel-chair bound self-labeled spastic, is named Jacob Nossell. Director Brügger introduced the two and sold them on the idea of traveling to Pyongyang to put on a series of slapstick comedy routines for various audiences. It’s all pretext, of course, for the director’s larger plan, which is to aim the spotlight directly at the DPRK, a terrifyingly oppressive police state under the harsh rule of its Dear Leader, Kim Jong-il. Under the watchful eye of their assigned chaperone, Mrs. Pak, the film maker puts one over on everyone. But not without a price. The emotionally fragile Jacob has a very hard time with the masquerade and is overwhelmed by the attention lavished on him by the hordes of perfectly manicured and behaving citizens who treat the guests like they walk on water. Only the whole adventure is out of some “Stepford Wives” meets . Jacob doesn’t know where to put all his emotions and has a breakdown of sorts. His confusion and pain only make the ambitious director seem all the more contemptible. To cast himself in this light is his saving grace. At the Q&A I attended after the screening, he was quite straight about his motives. He very clearly said that any conflicts he might have caused were worth it in the end. He was also wise to mention that Mrs. Pak was not thought to be in on the conspiracy, having been aware of the film makers’ ruse would have had mortal consequences for her. Apparently, all guests of North Korea are assigned a chaperone, and the chaperone is assigned a second point person always present. This way no one can succumb to the wiles of any capitalist visitors.